I always look forward to another adventure with Clare, Matt, Mike, and all of the gang at the Village Blend. 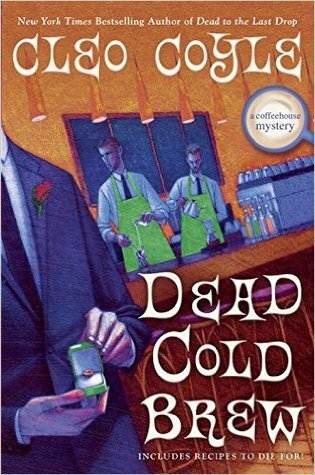 A lot of series seem to lose steam after a while, but Cleo Coyle manages to keep the Coffeehouse mysteries feeling fresh, even at #16. Her boyfriend Mike finally proposes, but a sniper is targeting members of the NYPD, leaving Clare in fear for her fiancé’s life. When her ex Matt’s godfather is poisoned, Clare sees a connection between the two cases that sets her and Matt on the trail of a blackmailer and jewel thief, and quite possibly a killer. Enter the Rafflecopter giveaway for your chance to win an awesome grand prize package from Cleo Coyle! Includes a signed hard cover edition of Dead Cold Brew, a $25 gift card, and more. Even though it sounds like there’s a lot going on in this book, it all sounds very interesting! It kind of reminds me of the Crossword Mysteries series on Hallmark Movies & Mysteries. Would definitely consider reading this book! I love this series and have listened to or read all of the books up to this one. I’ve listened to several as audio books too – I really this series! Great series, can’t wait to read “Dead Cold Brew”. Thanks for the really great giveaway. I love Cleo Coyle’s Coffeehouse Mysteries, and have re-read the series while waiting for a new book to come out. I love to visit Clare and everyone involved with the Village Blend Coffeehouse — they make me feel good! I know what you mean…the Village Blend almost feels real after reading and re-reading the books. Celia – You’re a sweetheart, thank you so much! I’ve owned the first in this series for a year now and I’m daunted to start it because there are so many. It is officially one of my New Year’s resolutions to dive into this series this year. I’m so excited!!! Thanks for the chance to win too! I enjoy the coffee house books a lot! Thanks for this chance. Sounds lik ea good read. Cleo’s series is fantastic. Fingers crossed I get lucky. I have only read one in this series, I will have to give it another try. I haven’t read every one, but I have enjoyed all of the ones that I have read!